Mid-September means states fairs, cooler temps, and a return to favorite foods. I’ve always been a fan of Chicken Parmesan and I an even bigger fan of “combination foods” where I get my veggies delivered in a yummy way with my need to eat like carnivore. 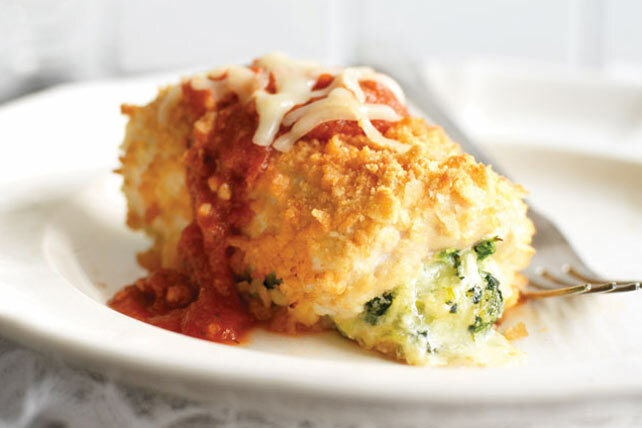 So, from the recipe people at Kraft comes this delicious recipe for Chicken Parmesan Bundles. Their cheesy center will be the highlight of dinnertime! Mix cream cheese, spinach, 1 cup mozzarella and 3 Tbsp. Parmesan until blended; spread onto chicken. Starting at one short end of each breast, roll up chicken tightly. Secure with wooden toothpicks, if desired. Whisk egg in shallow dish until blended. Combine cracker crumbs and remaining Parmesan in separate shallow dish. Dip chicken in egg, then roll in crumb mixture until evenly coated. Place, seam sides down, in 13×9-inch baking dish sprayed with cooking spray. Bake 30 min. or until chicken is done (165ºF). Remove and discard toothpicks. Serve chicken topped with pasta sauce and remaining mozzarella. If you want more info, YOU CAN WATCH THE VIDEO HERE. Ooo, sounds yummy! And if I weren’t totally lazy, I’d be making a ton of these. Ahhh, the things a Wolf does for his mate. 😉 And yeah. I need to figure out how to make a large batch and freeze some because while they’re pretty easy, they are messy.